Games like Call of Duty always do a good job of making you feel like you are part of a larger battle than you actually have direct control over. But what if all those things you saw on the screen you could actually shoot or affect? 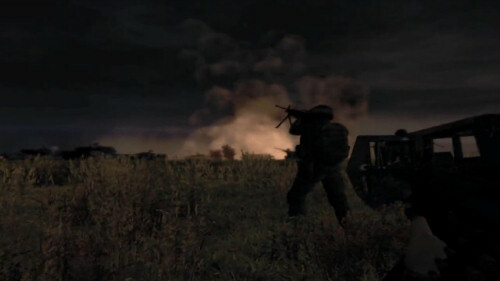 That's exactly what ArmA 2 looks to be promising. Two videos of the game have surfaced on YouTube, the first shows a night time battle with 1000 AI units fighting against each other. The fact that every noise you hear, every bullet you see, every man you shoot at, every aircraft that flies past, is completely real, unscripted, and dynamic. Thats why everything is just so realistic, you dont need to script a large scale war. But if that's not amazing enough, the same user has posted another video with over 1500 AI units battling it out during a rain storm. Thats right, over 1500 AI units are in this battle. 700+ U.S units attempt to defend their frontline as endless attacks are performed by opfor forces. Every single thing you see inside this clip are completely real, dynamic and unscripted. It appears these modes are skirmish style generated missions, and not the game's actual campaign. According to the author they are very CPU intensive, but the affect is simply amazing. The best thing is the ability to enjoy this with three other friends in the four player co-op mode. Four vs 1500? I'll take those odds.